My little flock, plus the Boyf Bird, have just returned from a fab holiday in Turkey and the “back to reality blues” have kicked in. Hurrah then for the fabulous team at Il Gusto, who clearly have psychic powers and realised yours truly needed some good cheer! Sitting on our doormat was a card from the postie saying we’d missed a parcel, so off we trundled to see what it was – only a flipping magnificent package of drinky-poos! Inside its snug packaging lay a Christmas Star shaped bottle of Turkish Delight Gin (very apt, given our holiday destination!) and a Champagne bottle shaped vessel of Pink Vodka with sparkly pieces of 22 carat gold dazzling within it. Il gusto, you will never know the joy you gave to me as I opened the parcel – I can’t thank you enough. Post-hols there is always the multitude of washing to do, and as I popped the first load in I felt the doldrums wash over me. 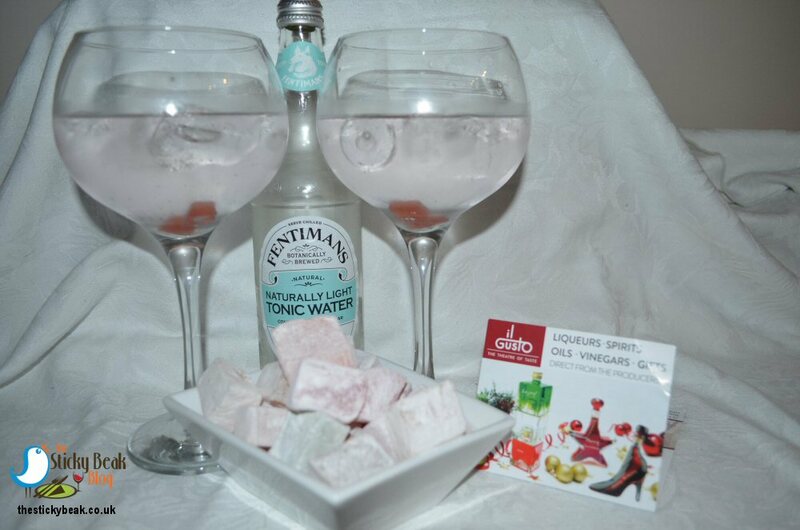 “Nope, not having that” I thought, and fetched my Turkish Delight Gin from its safe-keeping place. I had a quick snifter of it neat, before His Nibs twigged what I was doing; well, there’s got to be some perks of the job eh?! My days, it is simply divine. You get that glorious rose note on the palate, as well as a tempting sweetness on the tongue – this naughty minx is most sippable sans tonic, let me tell you. Having managed to have a cheeky tipple all by myself, undetected may I add (! ), I sauntered through to the kitchen, wafted the bottle under The Man Bird’s nose, and said “fancy some?” .He looked at me aghast until he realised I meant the Gin – cheeky swine! Anyhow, he waltzed off to fetch the swanky goblet glasses, some ice and a bottle of Fentimans light tonic (which we’d very kindly been sent by them a week earlier). Personally, I prefer this glamorous tipple with no adornment, but it wasn’t unpleasant with the tonic either; win-win for Gin! Now The Chick is becoming more of a Fledgling, His Nibs and I very often find ourselves surplus to requirements at weekends. One of our favourite things to do on evenings such as these is to make a batch of fresh Popcorn, pour some alcohol into glasses, and snuggle down on the sofa to watch a film. It seemed the perfect opportunity to try the Pink Vodka concoction that Il Gusto had sent us; Pink V Sparkling as it’s called. The colour is quite enchanting; a delicate rose pink with tiny speckles of 22 Carat gold leaf that twinkle cheekily within its swirling waters. As the pieces of precious metal twirled within the crystal glass, tiny rainbows cast their magical gleam in the light; it seemed almost a shame to drink the contents, but that’s what I had to do. I’m pleased to say that it tasted every bit as good as it looked. 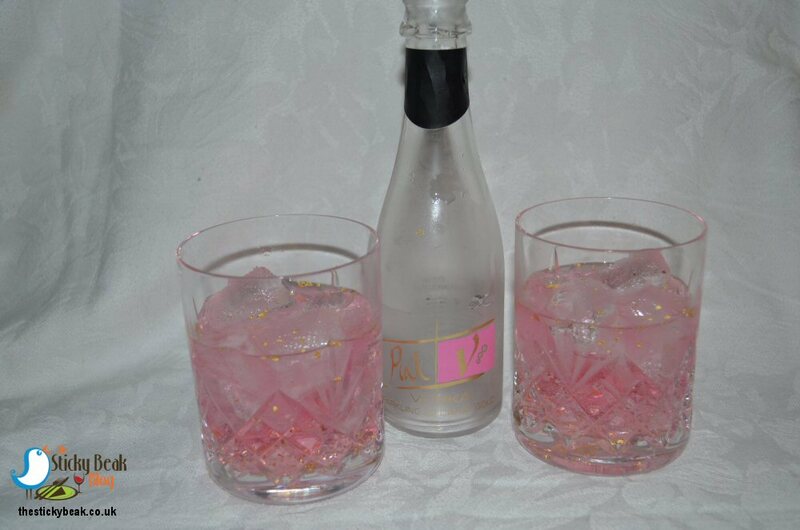 Pink V Sparkling has a faint flavour of Peach to it, and that lovely Vodka heat at the back of the throat when swallowed. This particular offering of Il Gusto’s has an ABV of 14.5%, so it’s perfect for sipping as you get ready to party or indeed if you fancy a relaxed night in (as we were having). Il Gusto don’t just do the range of drinks, they have a rather fabulous assortment of gourmet oils and vinegars too – perfect gifts for those friends or family that prefer to eat than drink (why choose? do both, I say!). 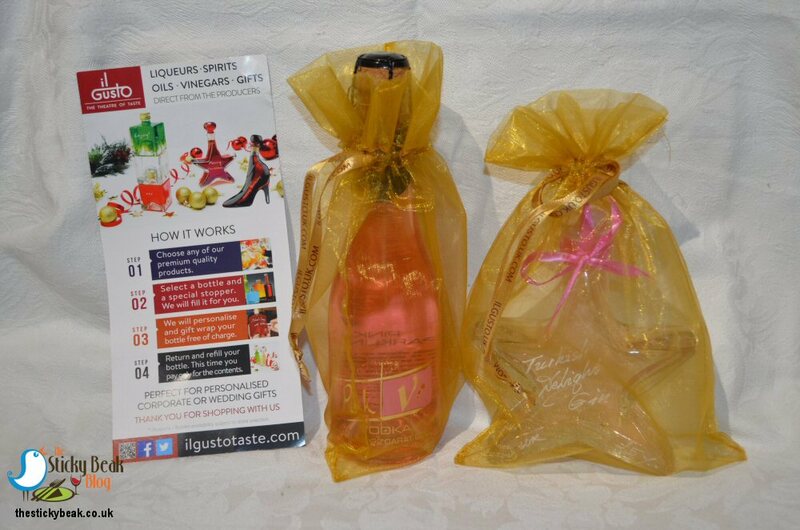 All Il Gusto’s products can be popped into a myriad of stylish shaped bottles (not necessarily Festive themed, if you don’t want this option) and you can try before you buy, which I think is a particularly nice touch. As well as the convenience of an on-line shop (where you can personalise your bottles free of charge btw), Il Gusto has got a pop-up kiosk in Nottingham, within the Intu Victoria Centre. This nifty little idea is open now (November) until the end of December 2018; I might just be nipping in after Christmas for some recovery tipples and Party juice for New Years Eve!